Get Jurassic on some dinosaurs in this frantic shooter. Have you ever wondered how humans would have interacted with dinosaurs had they shared the Earth at the same time? Dinosaurs would have been hunted and mounted on people's walls, just like most other wild animals. With this in mind, Dino Hunter: Deadly Shores allows you to hunt different kinds of dinosaurs and show these thunder lizards who the dominant species is. 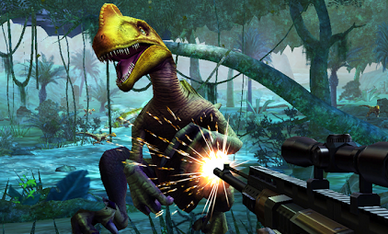 Dino Hunter: Deadly Shores sets you down in different regions, like the shores and jungles, of prehistoric Earth. There are many missions with several different kinds of dinosaurs, like the stegosaurus or the velociraptor. After each level, you receive a cash bounty to spend in the weapon shop. There are several different guns available to purchase, ranging from assault rifles to shotguns, and even specialty weapons like crossbows and rocket launchers. Each gun can also be upgraded to increase its power, magazine size or scope. To fight the bigger "boss" dinosaurs or trophy hunts, you need to upgrade your weapon if you are to survive. Even though there are a lot of guns available in the game, you will need to spend real cash to get the best ones. The game charges you gold, and the easiest way to get this currency is to buy it using real money. In addition, Dino Hunter can be a little repetitive. It takes a while to build up your weapons to fight the bigger dinosaurs. The game won't allow you to fight the trophy hunt dinosaurs without the upgrades, either. For most of the game, you shoot little dinosaurs or ones that don't fight back. There is also very little movement by your character in the game, so you can't even move out of the way when something attacks you. Dino Hunter: Deadly Shores is a solid shooter. The dinosaurs in the game are very well detailed and the game allows you to jump right in, but to really immerse yourself in the game and get the full experience, you will need to spend some money.